Located approximately 20 miles east of Mackinac Point and 2.6 miles northwest of Waugoshance Island, the shallows around White Shoal had long presented a hazard for vessels entering the Straits from the either the North Shore or the Manitou Passage. Lying in an east/west orientation, and almost two miles long, the shoal was so shallow that its west end broke the water's surface. With the dramatic increase in vessel traffic in the late 1880's, the Lighthouse Board specifically identified White Shoal, Simmons Reef and Gray's Reef as three Straits-area navigational hazards requiring immediate demarcation. While the construction of permanent navigational aids was preferred, it was soon evident that the anchoring of lightships over the hazards represented a significantly more expeditious and far more cost effective solution. Bids were submitted to a number of shipbuilders, with the $60,000 contract for the construction of three sister vessels awarded to the Blythe Craig Shipbuilding Co of Toledo Ohio. Wood framed and planked, the three identical 130 gross tonnage vessels were built with a length of almost 103 feet, a 20' beam, and a draft of 7' 5". Equipped with single-cylinder non-condensing steam engines, they were the first U.S. light vessels to be outfitted with self-propelling engines. Each vessel displayed a cluster of three oil-burning lens lanterns hoisted on the masthead, and a six-inch steam whistle and a hand operated bell for use during periods of decreased visibility. Work on the vessels was completed on September 15, 1891, whereupon they were turned over to the Lighthouse Establishment, and officially designated as LV55, LV56 and LV57. Upon receipt of the vessels, the Lighthouse Establishment conducted a series of sea trials through October 6. After a number of minor modifications, the three vessels departed the Lighthouse Depot in Detroit on October 19, reaching Port Huron that same evening, where they were met by the lighthouse tender Dahlia, who began towing them north along the western shore of Lake Huron. LV56 was finally delivered on station at White Shoal on October 24, and was secured to the five-ton sinker and 15 fathoms of 2-inch chain, which had previously been placed on the shoal in preparation for the vessel's arrival. Life onboard the vessel was evidently not too agreeable to the first crew of the LV56, since without orders they abandoned their station during a storm on November 17, and put into their winter quarters in Cheboygan. The entire crew was immediately discharged for dereliction of duty, and a replacement crew quickly selected. The tender Dahlia again towed LV56 back to her station on November 22, where she remained until close of the shipping season, when she received orders to return to her Cheboygan winter quarters. With the exception of her annual winter lay-ups from late December through ice-out in April or May, LV56 continued her faithful service at White Shoal for the following nineteen years. Largely as a result of repeated difficulties getting the lightship on and off station at the beginning and end of each navigation season, in 1906 the Lighthouse Board petitioned the U.S. Congress for the funds to construct a permanent light station on the shoal. Congress responded favorably on March 4, 1907 with an appropriation of $250,000 for the project, and with Major William V. Judson U.S.A.C.E, and lighthouse engineer for the Michigan District in charge of both the design and construction, work began at White Shoal the following year. Spring of 1908 saw work begin on the White Shoal light on two separate fronts. 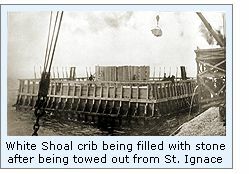 While a crew at the site leveled a one hundred and two-foot square area on the shoal through the addition and careful placement of loads of stone, a second crew worked on building a timber crib on shore at St. Ignace. Seventy-two feet square and eighteen and a half feet high, the huge crib contained 400,000 square feet of lumber, and on completion was slowly towed out to the shoal and centered over the leveled lake bottom. Once in location, the crib was filled with 4,000 tons of stone until it sank to a point at which its' uppermost surface was level and two feet below the water's surface. Work crews returned the following year to find the crib and pier in excellent condition, and the work effort turned toward construction of the tower itself. Work on this second year started with the erection of a skeletal steel framework that had been prefabricated offsite over the winter, and disassembled for shipment to the shoal. This framework was then lined with bricks and covered with a skin of terra cotta blocks. With an outside diameter of forty-two feet at the base, the tower tapered gracefully to a diameter of twenty feet at its' uppermost below the gallery. As work on the tower continued, the nine decks took shape within the tower. 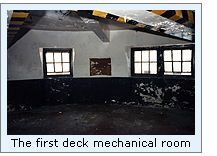 The first deck mechanical room housed the oil engine powered fog signal, heating plant, and storage for the station's powerboat. The second deck housed a tool room, bathroom and food storage area. 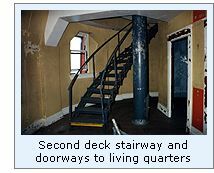 A kitchen, living room and one bedroom made up the third deck, with two more bedrooms and a toilet located on the fourth. 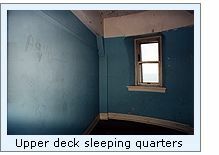 A living area and another bedroom were found on the fifth deck, and the sixth and seventh contained a single open room on each. The service room made up the eighth level, and the watchroom topped the living quarters on the ninth. Work at the station continued through the end of the shipping season in 1909, when once again the station was abandoned until work could resume with the receding ice in the spring of 1910. Work crews returned to the station on the opening of the 1910 navigation season, and the the tower was capped with a circular watch room and lantern room, both of twelve and a half feet in diameter. The aluminum lantern featured helical astragals, which the Board had recently begun incorporating in new construction, since it was believed that they offered less light interference than the vertical astragals that had been prevalently used for the past sixty years. 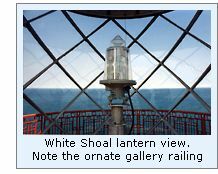 As construction of the tower wound to completion, the entire structure from the crib deck to lantern ventilator was given a coat of bright white paint, designed to improves the structure's visibility during daylight hours. After the District Lampist arrived at the site and installed the massive Second Order Fresnel lens the new light was exhibited for the first time on the night of September 1, 1910. Manufactured by Barbier, Benard & Turenne of Paris, the lens was built in a two-sided design known as a bi-valve configuration, with each side featuring 7 refracting and 15 reflecting prisms. In order to allow the heavy lens assembly to rotate with the minimum amount of friction, the entire structure was floated in a trough of mercury, and rotated by a clockwork mechanism, which was powered by hanging weights. Located at a focal plane of 125 feet, the lens rotated once every 32 seconds. Its 55mm double tank incandescent oil vapor lamp was thus magnified to 1,200,000 candlepower, making the light visible for a remarkable distance of 28 miles in clear weather conditions. 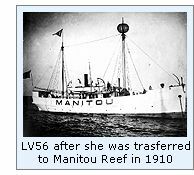 After activation of the new light station, LV56 was no longer needed at White Shoal, and the vessel was reassigned to duty at North Manitou Shoal, where she stayed through every shipping season until 1927 when she was once again reassigned to Gray's Reef. She was retired from service in 1928, and was sold into private ownership on December 20 of that same year. A submarine bell located in 70 feet of water approximately 3/4 of a mile from the crib was installed in 1911, and placed into operation on September 20. Powered by a submarine electrical cable from the station, the sound transmission property of the water allowed the bell to be heard through the hulls of approaching vessels long before the fog signals could be heard in thick weather. 1913 saw the installation of a pair of compressed air operated deck cranes for unloading supplies, and for raising and lowering the keepers boat which was used for both bringing supplies and taking shore leave. To further improve the station's efficacy during thick weather, the six-inch whistles were removed and replaced with 10-inch whistles on April 22, 1914. Proving to be less successful as originally intended, the submarine bell was permanently discontinued at the end of the 1914 season of navigation. In 1930, twin diesel engine-powered generators were installed in the mechanical room, providing electrical power to both the living quarters and the light, which a resulting increase in output to 3,000,000 candlepower. With its multiple windows an all sides of the tower, duty at White shoal was surprisingly comfortable during the summer, since there was always good cross ventilation. In the Spring and early winter, the oil engines furnished steam heat to radiators located on all floors, keeping the temperature comfortable year-round. After the Coast Guard's assumption of responsibility for the nation's aids to navigation in 1939, four-man crews were assigned at the station. Working a 14-days on and 7-days schedule, three seamen were always on board while the fourth man was on Liberty. The station was automated in 1976 with the installation of a 12-volt DC solar-powered 190mm Tidelands Signal acrylic lens. 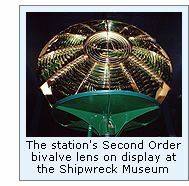 The Second Order Fresnel was dismantled in 1983, and relocated to the Shipwreck Museum at Whitefish Point Light Station where it is proudly displayed to this day. A Coast Guard crew arrived at the station in 1990, and the tower was repainted with its' current "candy cane" red and white spiral daymark. With the application of this daymark, White Shoal stands as the only tower on all of the Great Lakes to feature such a diagonally banded paint scheme. As of this writing, we have been unable to determine the fate of LV56 after she was sold into private ownership in 1928. If any of our visitors have definitive information as to the history of this vessel after that date, we would appreciate hearing from you. Click Here to see a complete listing of all White Shoal Light keepers compiled by Phyllis L. Tag of Great Lakes Lighthouse Research. Email correspondence with Timothy Larson and Art Miller who both served at the station with USCG.